What are blue holes? | How Blue holes are formed, in which only bacteria can survive? How OM got his name? These are the big tunnels that can be seen in oceans. These are called ‘Blue holes’. 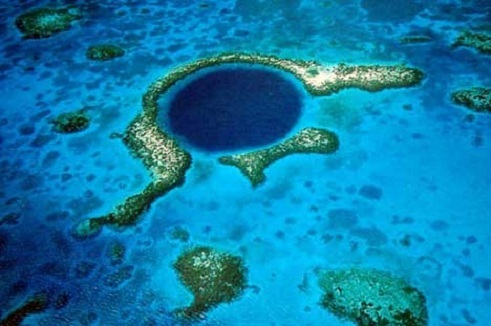 Each blue hole is around 100 -120 meters deep. The depth of the Great Blue Hole is 203 meters. The reason for formation of these Blue holes is that the sea level in ice age was at least 120 meters less than the present level. Big formations of soil, stones and minerals were destroyed at the end of the ice age. Blue holes were formed then. Only bacteria can live in these blue holes. These are not convenient for ocean creatures to live. It is a strange thing that there are holes in the ocean also. Which is the Biggest Man-Made Lake in the World? Why Smoke comes from Mouth in Mornings of Winter Season? How Do Humans Identify Smells? Which Is the Smallest Snake in the World? How Was Vaccine for Smallpox Discovered? Which Is The Smallest Fish In The World? Why Is Alcohol Used In Radiators Of Vehicles In Cold Countries? Why the Hairs of Paint Brush get separated when put in Water? What Is The Speciality Of Oresund Bridge?